Situated in a secluded fruit orchard, surrounded by clusters of towering bamboo, the Villas by the Big Bamboo is a private and secure community dedicated to those individuals who have decided to commit to a convenient inland residence. Built to the same exact standards as the successful Villas Overlooking Layan development, these homes have well-appointed interiors, infinity pools and a long lasting build quality from the developer’s 25 years+ experience building on Phuket. This central location is perfectly suited for the Phuket lifestyle; world-class beaches within 10 minutes, shopping, with world-class golf courses and yacht marinas within easy reach …. Simple and easy, non-traffic routes to the international schools and only 20 mins from Phuket international airport. The villas are a contemporary design classic; featuring clean lines and bold statements of grey, black & white, all highlighted by the developer’s signature stacked slate accents, contrasted beautifully by the lush tropical surroundings. Space is assured in all the villa options at the estate; from 3-bedroom pool villas with 382 sqm of developed area, all the way up to 5-bedroom pool villas with over 550 sqm of developed space. The villas are surrounded by tropical gardens and lawns, whilst a traditional Thai Sala is provided to offer shade from the sun. There is covered parking for two cars and additional driveway space for a further two cars at all of the villas. Construction is well underway, with a completed 4-bedroom single level villa, plus two 3-bedroom pool villas all ready to move in. The Villas by the Big Bamboo offers a variety of freehold and leasehold ownership structures to accommodate any buyer’s needs. 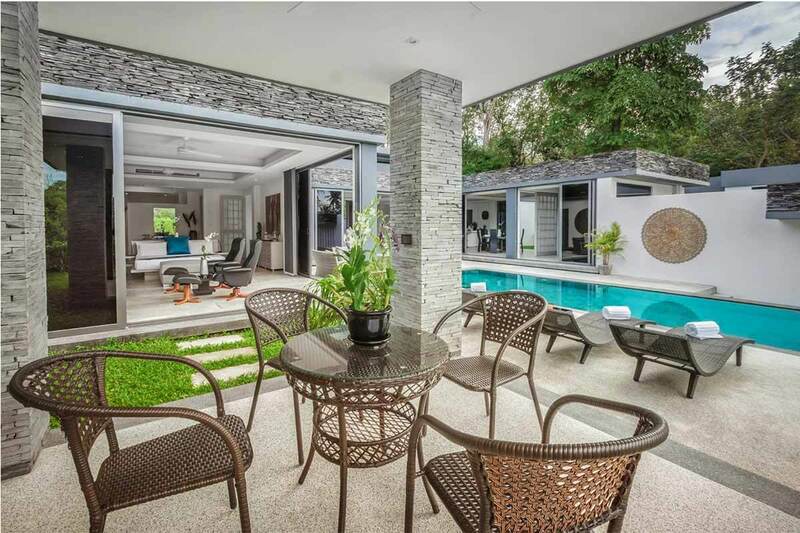 Should you be in the market for a competitively priced, quality residence on Phuket, the Villas by the Big Bamboo is definitely worth a visit. The villa shown is a 4-bedroom single level property of 575 sqm of built area, occupying a 1,200 sqm chanote land plot. The sales price is 35M Thai Baht. Three-bedroom pool villas of 382 sqm are also available, with prices starting at 20M Thai Baht.